Every five years, Congress passes a bundle of legislation commonly called the farm bill, setting national agriculture, nutrition, conservation and forestry policy. The last farm bill expired in 2012, but a partial deal was passed January 1 that extended several programs. Agriculture Professor Emeritus Randy Winter teaches a class on ag policy that focuses on elements of the farm bill. In STATEside’s latest edition of its Office Hours faculty Q&A series, Winter said he’s not optimistic a bill will be passed this year but expects it early next spring. What is the purpose of a farm bill? The first comprehensive farm bill was passed during the Great Depression. The primary focus of that legislation was to support prices and income for farmers. Through the years, farm bills have become much broader in scope. The current farm bill, officially the Food, Conservation and Energy Act of 2008, now includes major provisions for a wide range of programs such as conservation, trade policy and promotion, nutrition and food aid programs, agricultural research, renewable energy, and rural development. The farm bill still provides for some price and income support for farmers but the emphasis has shifted toward a safety net approach with a greater focus on crop insurance rather than directly supporting farm prices and income. The Supplemental Nutrition Assistance Program (SNAP), more commonly known as the food stamp program. In the current economic environment, there is a strong focus on cost reduction. 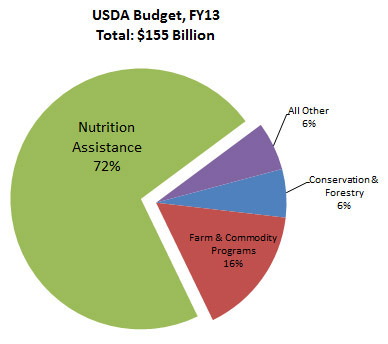 Since food and nutrition programs account for the largest portion of the budget (see pie graph at right), that is the area with the greatest opportunity for significant cost savings. One of the most contentious issues in the debate is the magnitude of cuts in those programs. In general, Republicans are calling for more substantial cuts in these programs, but Democrats are resisting those reductions. Why should the average consumer care about this? Could it affect food prices? The farm bill affects nearly every single producer and consumer, not just in the U.S. but worldwide. Food and nutrition programs account for the largest portion of the U.S .Department of Agriculture budget with about 15 percent of the U.S. population receiving some sort of food assistance through these programs. Provisions of the farm bill influence agricultural imports and exports—with a direct impact on the amount and variety of products that appear in the grocery store. Provisions of the law also impact the conservation and protection of our natural resources (soil, water and air) as well as the expansion of renewable energy. Are you expecting any dramatic changes? Farm bills tend to be evolutionary rather than revolutionary. They tend to get tweaked a bit, but it is rare to have a landmark change in the way we do things. One area that seems to have broad support is the elimination of so-called “direct payments” to farmers. These are income support payments that are made irrespective of current price and production conditions. In light of the strong economic performance in the farm sector in recent years, these payments have become politically unacceptable. There are some proposals to remove the food and nutrition programs from the farm bill, but I think this is less likely to happen. Have any programs been shut down/suspended because of the expired bill? All payments and programs associated with prior agreements and contracts continue in force. However, there is no sign-up or provisions underway for the 2014 crop year.